Glenavon will face a Derry City XI at Mourneview Park on Thursday night in a game being held to raise funds to enable former footballer Mark Farren to receive cancer treatment in Germany. The current Glenavon squad will face a Derry team made up mainly of former team-mates of the Donegal man. Those players are expected to include the likes of Barry Molloy, Ciaran Martyn and Ruaidhri Higgins. Farren recently underwent a third operation on a brain tumour. On Friday, Farren's family released a statement appealing for financial help to help raise around £25,000 which will enable the former footballer to undertake treatment at a specialist cancer centre in Germany. In his most recent operation, surgeons removed over 80% of Farren's tumour but the 33-year-old's speech and mobility have been affected. A biopsy after the surgery indicated that the tumour was highly aggressive. On Friday night, Farren's former Derry City team-mate and current Republic of Ireland international James McClean was reported to have pledged £1,000 for the fund. Greencastle native Farren was named the League of Ireland players' player of the year in 2005 and went on to become Derry's record goal-scorer in 2012 before joining Glenavon in 2013. He was initially diagnosed with a benign brain tumour in December 2008 but continued to play on for Derry City until October 2009. 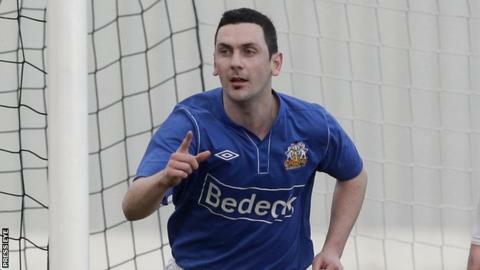 After undergoing surgery, Farren returned to Derry City colours in the summer of the 2011 and broke the club's scoring record a year later shortly before signing for Glenavon. Farren was named the Irish League's player of the month in April 2013 but had to stop playing later that year in order to undergo more surgery. Glenavon manager Gary Hamilton has appealed for fans to support Thursday's match. "I'm sure all the good people around the club will come out and support Mark in this very serious situation in his life," said the Glenavon boss.